An auto component manufacturer was expanding their operations which required for a building expansion. The new expansion provided an additional 7 ft more vertical storage than their existing building. REB designed several layout options with different elevations to maximize the company’s vertical storage and accommodate the various sized products and SKU’s that needed to be stored. In addition to pitching multiple design options, REB included an option for future reconfiguration featuring a very narrow aisle (VNA) design. This would allow for more storage density while remaining in the same facility. Due to the high number of SKU’s and product sizes, the final design included selective, carton flow and cantilever systems to be integrated for higher density and faster picking. This project was divided into two phases. 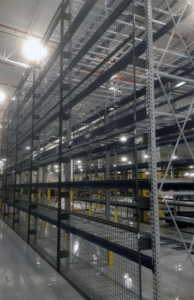 The first phase included selective rack throughout the building including a double deep racking design for their longer products and carton flow at hand-picking shelf levels for smaller inventory. Phase two required a unique storage solution for their longer products such as flat sheet steel. Due to the height restriction of their overhead crane, REB designed a double-sided cantilever system each with (7) storage levels on each side each level supporting a maximum weight of 6,000 lbs. The expansion building now features a unique design that maximizes the company’s vertical storage and is designed to be reconfigured for future growth without the need to relocate. Integrating selective, carton flow and cantilever racking systems allow for products of varying sizes to be easily stored and accessed faster for picking.